This Tuesday, FC Barcelona announced that it is renewing its sponsorship deal with Estrella Damm for the next four seasons, thus continuing a relationship between the two parties that dates back more than 25 years. The new agreement expands on the relationship between the club and the beer company, whereby from 1 July 2018, Estrella Damm will become an FC Barcelona Global Partner. 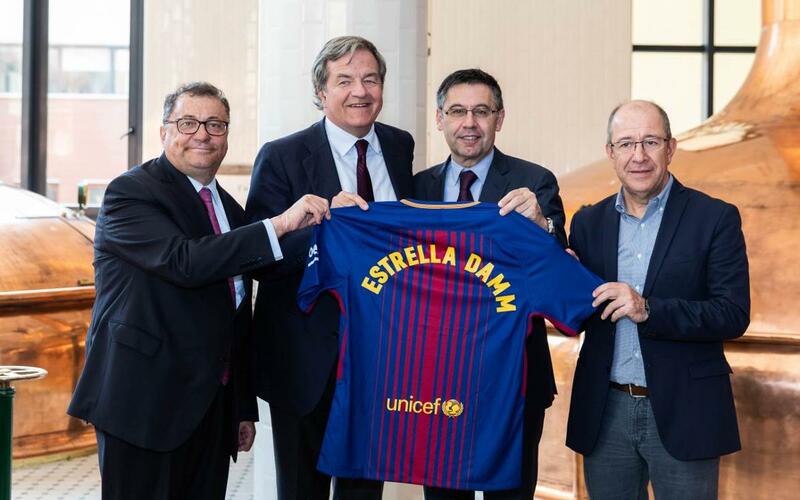 For the next four years, Estrella Damm will also be maintaining its status as ‘Official Beer of FC Barcelona’ and the brand will continue to feature at the Camp Nou and other club facilities. The new agreement was officially signed at a private event in the Old Estrella Damm Factory that was attended by the president of FC Barcelona, Josep Maria Bartomeu; its vice-president and head of Marketing and Communication, Manel Arroyo; the director general of Damm, Jorge Villavecchia; and the managing patron of the Damm Foundation, Ramon Agenjo. This new agreement is a major step forward in the growth expected from the Strategic Plan that was approved by the Board of Directors for this mandate, and forms part of the club’s goal of proactively seeking the most suitable partners in terms of the values and features that define the brand, and to seek out the best possible contract in the sports marketing world for each category. Barça and the beer company are two century-old institutions that have shared a number of actions over the years that have helped to bring Barça fans together to share the many achievements and titles year after year. These actions have especially included the Estrella Damm Champions bus that parades FC Barcelona’s players and trophies each year after winning La Liga, the Champions League or the Copa del Rey. The Joan Gamper Trophy Fiesta and the Man of the Match Trophy are other activities in which Barça and Estrella Damm celebrate together at the start of each season.